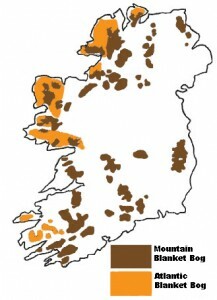 Blanket bog formation in the mountains and lowlands of the west of Ireland started at the end of the last glaciation, 10,000 years ago. 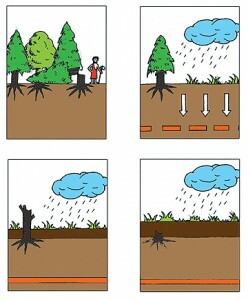 Initially peat formation was confined to shallow lakes and wet hollows. Over time an infilling sequence from open water to fen and acid peat occurred to form the blanket bog habitat we find today. Later, acid peat spread out to form a blanket covering huge areas of poorly drained land. While some spread may have taken place as early as 7,000 years ago, many areas were not engulfed until 4,000 years ago when the climate became wetter. Heavy rainfall caused minerals such as iron to be washed out or leached from the surface layers of the soil, a process know as paludifacation. These were deposited lower down where they formed an impermeable layer known as an iron pan. Water cannot move down through such a layer and the soil surface became waterlogged as a result. Under these conditions the accumulation and spread of peat was made possible. Mountain Blanket Bogs occur on relatively flat terrain in the higher Irish mountains above 200m O.D. and are more widely distributed than Atlantic blanket bogs. 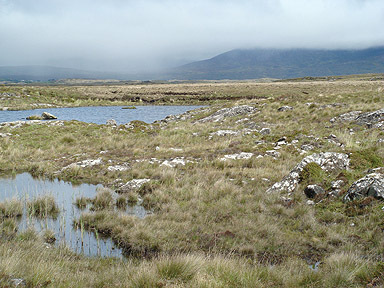 Atlantic blanket bogs and mountain blanket bogs are the most extensive of the Irish peatland types and originally covered an area of 774,360ha. Blanket bog occurs on flat or sloping land with poor surface drainage, in cool, wet, oceanic climates. Moore et al. (1984) describe blanket bogs as a “complex unity combining flushed and ombrotrophic peatland types which occupy a variety of geomorphological positions and which become inextricably linked in an interdependent, but floristically and hydrologically diverse, series”. If the climate is sufficiently cool and wet, basins, plateaux and gentle slopes come to be swamped by peat, formed from acid vegetation. Peatland formed by the terrestrialisation of basins or the paludification of plateau and gentle slopes at different places in the same landscape, eventually coalesce to form a blanket bog complex. 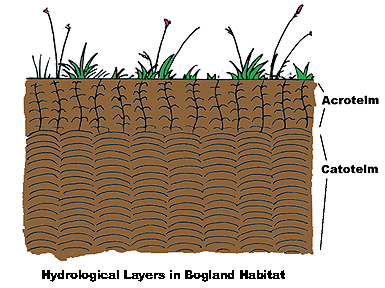 Therefore blanket bogs are complexes which combine several congruent and hydrologically inter-related peatland sites into a continuous peatland system. Within the complex, the underlying peat varies considerably in depth and humification, according especially to the angle of the slope and the degree of waterlogging. Morphologically the blanket bog peat body is diplotelmic in profile as in raised bogs. It is divided into two distinctive hydrological layers, the acrotelm and the catotelm. Blanket bogs are valuable wetlands, not wastelands. There are a number of scientific, economic, cultural and moral reasons for conserving blanket bogs. Only a small amount of blanket bog exists in the world. Ireland possesses 8% of the world’s blanket bog and is the most important country in Europe for this type of habitat. Blanket bog landscapes provide a refuge for a rich biodiversity of species including several rare plants, birds and invertebrate species. Blanket bogs are commonly used as rough grazing land for sheep and cattle, grouse shooting, deer stalking and fishing. Blanket bogs preserve prehistoric farming landscapes beneath the peat as well as a diverse range of artefacts within the peat mass. 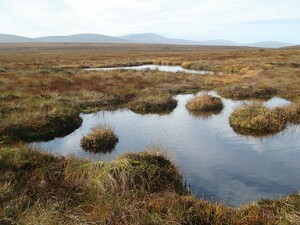 The patterns of pools on the flatter areas of blanket bog is of particular conservation significance. The pools support a specialised range of mosses (especially species of Sphagnum) and plants and they provide essential feeding habitats for wetland birds. Within their peat layers, blanket bogs preserve a record of their own growth and development and on a larger scale, they provide insights into regional vegetation change, climate change, atmospheric pollution and act as chronometers for other events such as volcanic eruptions. Blanket bogs accumulate and store millions of tonnes of carbon and have a vital function in controlling the green house gases that cause climate change. Blanket bogs contain in excess of 90% water and act as vast water reservoirs. They have a vital role to play in the management of water within river catchments. Blanket bogs and their utilisation for recreation can have positive benefits on the health of people. Under the EU Habitats Directive the National Parks and Wildlife Service (NPWS) are obliged to complete a report every 7 years on the condition of designated habitats. The assessments carried out in 2006 and 2013 found that no peatland type of priority importance in Ireland is in good conservation status. Blanket bogs were given a BAD assessment in these reports due to the loss of their area, structure and function. 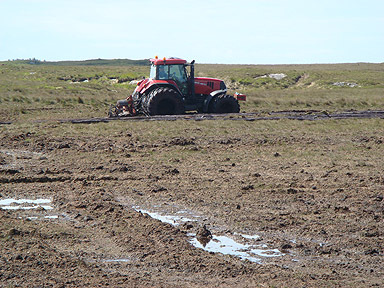 The drivers of the loss of blanket bogs include reclamation, peat extraction, afforestation, over grazing, drainage, burning, erosion and landslides. Originally 908,117ha of blanket bog covered the island of Ireland. 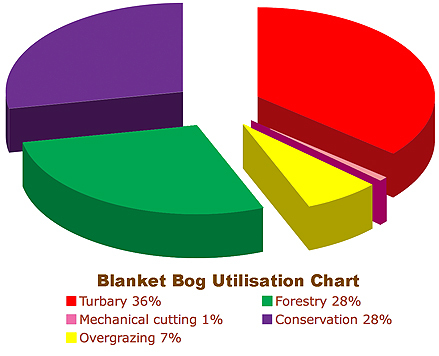 Although blanket bogs originally covered more than 774,367ha of the land surface in the Republic of Ireland (Hammond Peatland Map 1979), hand cutting over 400 years, the introduction of large-scale, mechanised turf extraction, afforestation programmes, intensification of agriculture and land reclamation have seriously depleted the area of blanket bog suitable for conservation. IPCC monitors the status of the resource on an on going basis. Our assessment of 2009 was published in Ireland’s Peatland Conservation Action Plan 2020. This found that only 28% (216,599ha) of the blanket peatland resource remains in a relatively intact condition in the Republic of Ireland. Traditional cutting of the bogs for turbary is having a serious impact on blanket bogs. 36% of the blanket bogs have been cutaway by this process. Peat is still being cut privately. Grazing pressure on blanket bogs although particularly severe during the last century mainly by cattle did not result in degradation of this habitat. Sheep replaced cattle as the principal grazing animal with the introduction of EU farming subsidies in the 1980’s and have caused severe erosion and complete loss of sites. Overgrazing has led to erosion and habitat loss of 7% of the area of blanket bog since 1980 and in 2000 a further 7% was deemed threatened by this activity. Large-scale afforestation schemes have had a huge impact on blanket bogs with planting on 28% of the original area within the Republic of Ireland. EU and Government incentives introduced since the mid 1990’s have resulted in an interest in wind energy developments which seriously degrade the integrity of mountain blanket bogs. Another cause of blanket bog degradation is the colonisation of the habitat by invasive alien species such as Rhododendron ponticum and Pinus contorta. In 2016 IPCC mounted a two year campaign to shift the national focus to blanket bogs and bridge the significant policy gap that exist in relation to their protection. The campaign aims to engage in lobbying and advocacy to ensure that blanket bogs are highlighted as a national issue. The first step was to set up an online survey to assess what damage and threats currently face blanket bog. This involved a step into citizen science as we asked users to fill in our survey and tell us of their experience while visiting such sites. This allowed us to analyse which issues were causing the most pressure to this precious habitat and allowed us to emphas ise these in meetings with key Government officials. 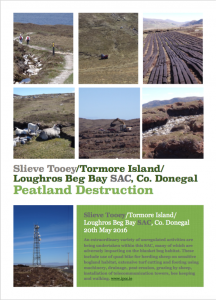 Take for example Slieve Tooey/Tormore Island/Loughros Beg Bay SAC in Co. Donegal which was used as a case study to highlight the variety of uses currently found on blanket bog. The survey provided evidence of a wide range of threats including the use of quad bikes for herding sheep on sensitive bogland habitat, extensive turf cutting and footing using machinery, drainage, peat erosion, grazing by sheep, installation of telecommunication towers, bee keeping and walking. Please follow this link to the blanket bog campaign.